Here's where I post about my current role-playing game design consulting, with the permission of the clients. Sometimes it's a text piece, sometimes it's video or audio. Sometimes it's a discussion, and sometimes it's a playtesting session. Check out the Testimony and What I Do items below to see what it's about. If you want to become a client, please click on the "Come into the Lab" link to contact me for initial discussion. If we agree it's a good fit, then the fee is $100 (~925 SEK; ~90 Euro) for three sessions. Here's the first consulting session with BPG, author of Directions Storyplaying System, of two sessions we've done which includes a pretty detailed amount of "let's play" across two of them. I found working with this system simultaneously with Tales of Entropy to be a little challenging, as they share the rhetorical philosophy of design and play, but fortunately they turn out to be rather different. 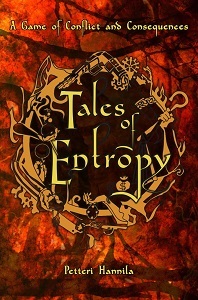 I've stitched together two consulting sessions with Petteri Hannila, the author of Tales of Entropy. The first part is audio only, but please view rather than listen, because I've filled it all with visual content. I'm beginning to make these sessions work both privately and publicly. The absolutely nascent stage of game design sometimes isn't any different from how you found yourself spinning some feature of some other game you happened to be playing. One may even "know" that hey, wherever I go with this will be something different, even when still thinking so closely to the primary experience that it's pretty much the same as tweaking it at the table.